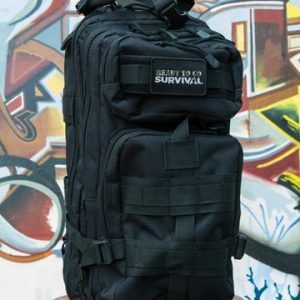 The Tactical Traveler Tactical Survival Kit is the first kit we created at Ready To Go Survival and it’s been our top seller ever since. 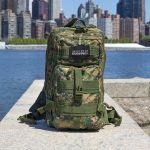 Weighing in at just 20 lbs, it’s got everything you need for a variety of emergency situations, making it the best pre-made bug out bag kit on the market. The narrow design is intended to keep you from snagging on anything while en route, allowing you to traverse both the brush or the urban jungle with ease. 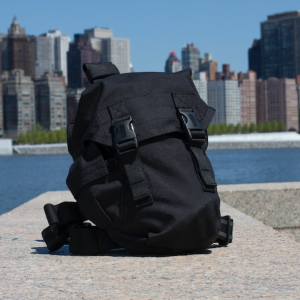 With the many optional attachments, this tactical bug out bag can be customized for urban, suburban and rural environments. 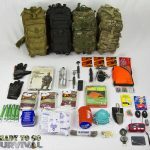 With this tactical survival kit, you no longer have to choose between having something lightweight or all encompassing. 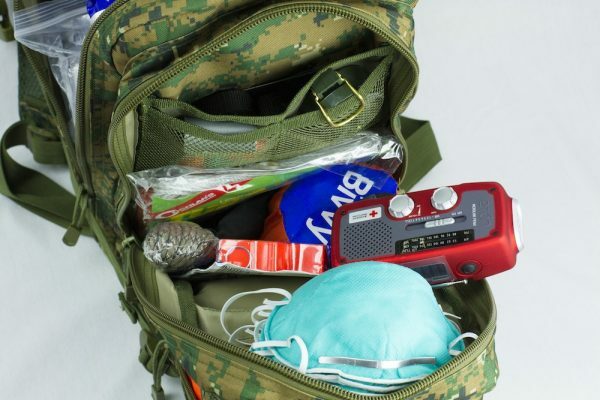 This kit comes with almost everything you would need such as food bars, fire starters, blankets, water, first aid items and even self-defense items like a knife and safety goggles. 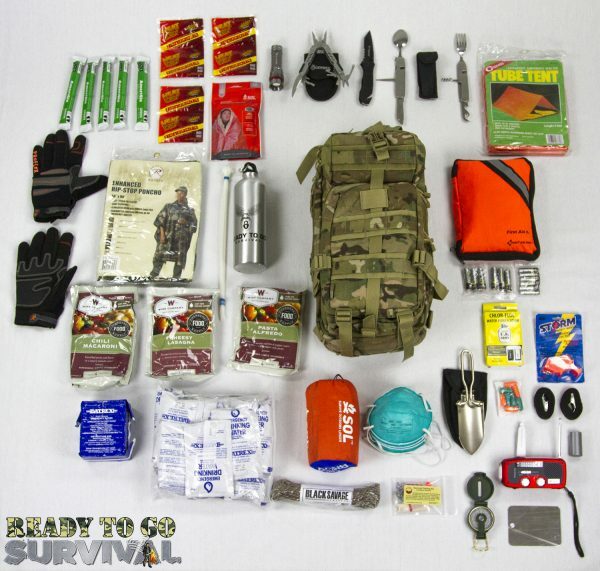 Considering all of the items included with this tactical survival kit, would you believe that it’s only 20 pounds? Of course, if you include your own items it may end up going over the mark. It’s perfect for short backpacking stints though you won’t be able to bring it on a plane as a carry-on due to the included blade. Of course, its supplies aren’t limitless. In order to keep it fully stocked, remember to replace any items you use like the emergency water, food bars and purification tablets. That way you will can rest assured you’ll always be prepared regardless of the situation. 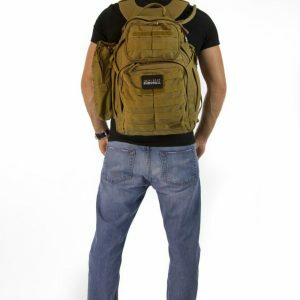 (1) Medium Transport PackThe Medium Transport Pack has a great balance of durability, storage capacity, ergonomics, and price, which makes it perfect for a tactical bug out bag. 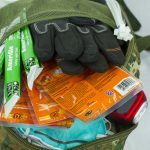 Team RTGS uses these packs regularly to commute to the city, go on hiking trips, hit up the shooting range, go to the beach, and run day to day errands. 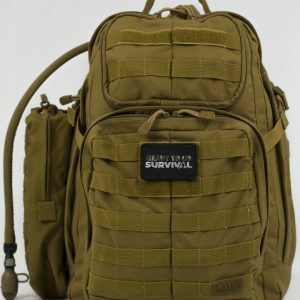 This pack has enough room to fit all the preset tactical survival kit items, as well as some extra space for personal items. (1) 18 Datrex Emergency Food Bars (3690 cal) Even if you haven’t witnessed a disaster first hand, you’ve seen the devastation they cause and you know that you can never be too prepared. 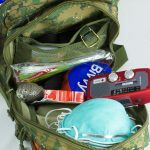 In regards to food, a tactical survival kit like the Tactical Survival contains a quick boost of nutrients. Food rations from Datrex are made from all natural ingredients, have high energy value and are tabletized and sub packaged for easy rationing. They have a five-year shelf life and are also USCG approved so you know you can count on them when you need them most. Safe drinking water is probably the most important thing to have in reserve when disaster strikes. 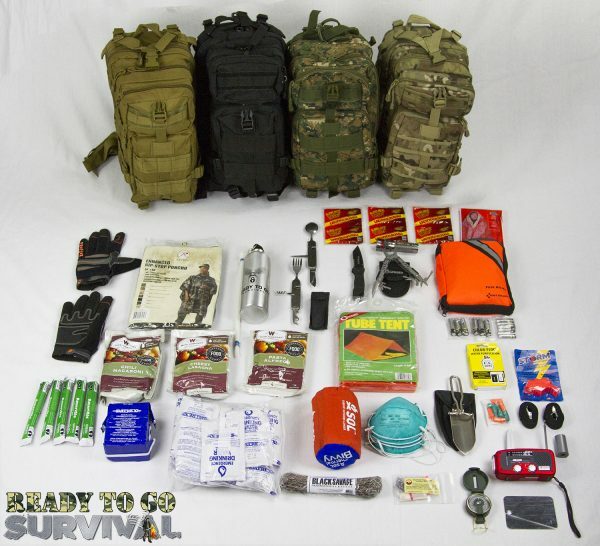 No tactical survival kit is complete with out water. The Tactical Traveler offers 125 ml sachets of Datrex purified water are easy to dispense and loss is minimized due to the durable packaging. USCG, Canadian Coast Guard, EC and NZ approval, with a five year shelf life. 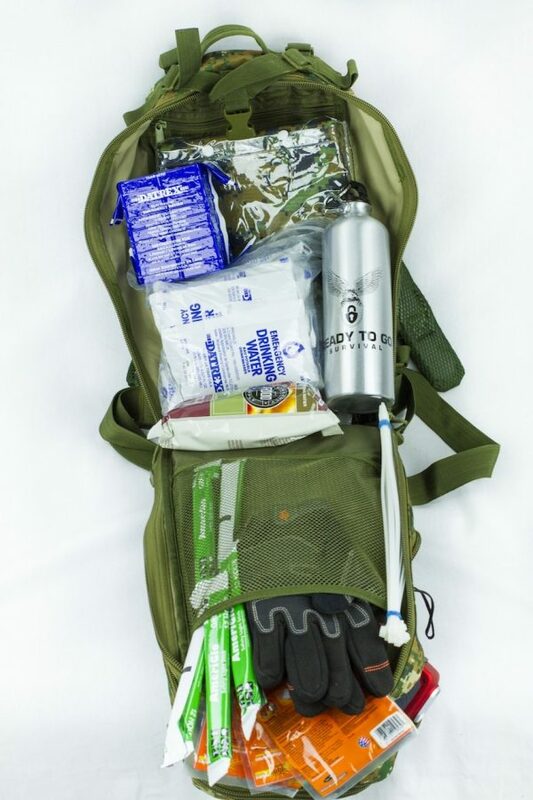 The Tactical Traveler comes with 20 packets, which is equivalent to 2.5 liters of water. This tool will help you get a fire going quickly and safely – Simply pull the unit apart, prepare your tinder, and strike the ferrocerium rod against the metal striker to release a storm of burning sparks. This rod contains a waterproof storage compartment to keep your tinder dry, and has an integrated whistle for quick access when you need it. A piece of lanyard also keeps the components secure while it’s open to ensure nothing gets lost. WetFire Tinder is a universal lighting material that is safe, lightweight, and easy to carry. Guaranteed to light in windy or wet conditions and only requires a small amount of tinder to build a fire. (1) SOL Emergency BlanketThe most advanced emergency blanket on the market – meticulously designed never to fail when you’re counting on it with your life. It all starts with the material – vacuum-metalized polyethylene reflects 90% of your body heat while also offering a number of other important features that set it apart from traditional mylar blankets: it opens easily and will not shred if nicked or punctured, rips and tears can be repaired, it is quiet and won’t crinkle in high winds, and its high-visibility orange exterior makes it easy for rescuers to find you. Sized to fit one person. (1) SOL Sleeping BivvyThe 6.5oz Adventure Medical Thermo-Lite 2 Bivvy provides an emergency shelter for day trips that run a little long, and it can even replace your sleeping bag in warm weather. This water-resistant bivy sack gives you insulation similar to a 50F sleeping bag, so you can bring it alone on ultralight overnight trips in the summer. The Thermo-Lite 2 nylon material holds in heat and fights off moist weather during an un-planned overnight stay in the backcountry. (1) Coghlans Tube TentThe tube tent is a great emergency shelter that has been used by survival experts for many years. It’s quick to set-up, lightweight, and can also be used to quickly gather rainwater. A tube tent is only a suitable shelter in a survival situation; it would not be suitable for living beyond a several day period. If you’re looking for something that can sustain you for a longer period of time, please check out our Basecamp II expansion module. (1) Rothco Rip-stop PonchoThe Rothco Rip-Stop poncho will help keep you dry, which in turn keeps you healthy. Wetness leads to chafing, blisters, hypothermia, and other generally bad things. Stay dry my friends! (1) Gerber Multi-Tool (optional add-on item)From cutting twine to opening a can of soup, this multi-tool from Gerber is like having an entire tool box in your pocket. Lightweight and compact, it features needle nose pliers, serrated knife, can opener, bottle opener, corkscrew, wire cutter, crimper, Fiskars scissors, crosshead screwdriver and small, medium and large flat blade screwdrivers. All components lock in place and the built-in safety prevents accidental openings. Stainless steel construction and made in the USA. (1) Camping Steel Detachable Eating UtensilEating utensil detaches so fork and knife can be used in separate hands. Other attachments include a bottle opener, can opener, and spoon. It also comes with a nylon pouch so you can store the utensils away when not in use. 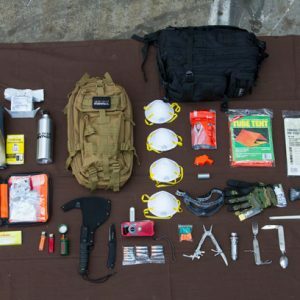 A true survival fishing kit in a very small, lightweight package. This kit is contained in a package measuring 3″ x 5.25″, and weighs only 2.3 oz. The line winder enables a firm, comfortable grip that allows positive control of the line, and the lures will give you a great chance at actually catching something as quickly as possible. The carry pouch is made from strong, durable plastic that is resealable, and the kit comes with instructions on how to tie the line, with drawings, and attach the sinkers. The sharps in this kit are covered in a plastic sheath that is easily removed. 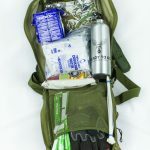 This kit is ideal for a wide variety of survival & emergency situations, but could also be used for camping and water-borne adventures. (1) Steel Folding TrowelA trowel (AKA small shovel) can be used for water procurement , waste disposal, digging for shelter purposes, digging to hide stuff, along with many other uses. Here are some specs of the included Trowel. 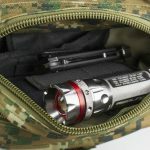 (1) Nebo Redline Tactical Flashlight 220 Lumen w/ strobe S.O.S.The Redline 5 lighting modes, 100% white light (220 lumens), 50% white light (110 lumens), 10% white light (22 lumens), S.O.S. mode (220 lumens), or emergency strobe mode (220 lumens). This flashlight has a 4x adjustable beam that works with any light setting to change the Redline from a flood light to illuminate everything within a 20 yard distance, or to a spot light to focus up to 150 yards. The light is strong enough to temporarily blind someone in a self-defense situation, possibly giving you enough time to escape and get to safety. These light sticks are used by military, law enforcement, paramedics, campers, hikers, scouts, utility companies, hotels, schools, boaters, and well-prepared individuals all over the world. 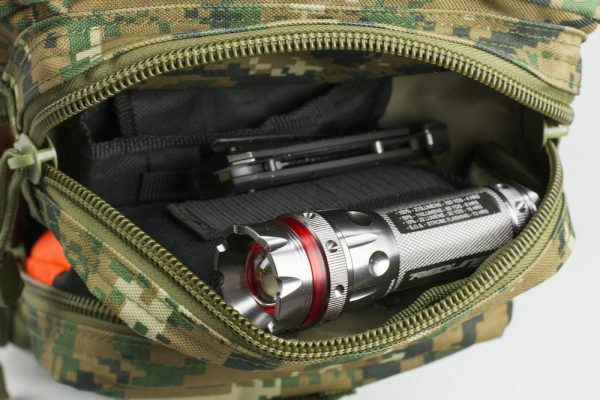 The Ameriglo 6″ is the only US Military approved light stick with a special locking hook. Emergency personnel and troops alike prefer AmeriGlo light sticks for its versatility in the field, using this special locking hook for a myriad of attachment options. (1) Eton Crank Radio (optional add-on item)The FR1 is designed to keep you safe and sound, all charged up and ready to know. Perfect for everyday use or in case of emergency. Small enough to store in an emergency kit, backpack or glovebox, the FR1 packs a ton of features into a super compact size. And it’s mighty enough to charge most smartphones, play tunes and news, receive weather alerts, and light the night. Stay in tune and up to date with this AM/FM/NOAA weather band digital radio with display and alarm clock. Plug in your favorite headphones for solo listening. The FR1 powers up in multiple ways—via hand crank, built-in rechargeable battery, or use DC power via the included micro-USB cable to charge the FR1’s built-in rechargeable battery. To charge your smartphone, simply plug your charging cable into the USB port. Push the ‘CELL’ button and it will begin to charge to your phone. The FR1 has enough power to fully charge most smartphones when fully charged. Great for signaling, looking at yourself while grooming, and observing places of your body that aren’t easily observable. (1) Smith & Wesson Tactical Ops Knife w/ belt cutter & glass breakerThis knife comes personally recommended by Roman from RTGS. Its utilitarian features include a seatbelt cutter, glass breaker, and a razor sharp edge, making it ideal for personal protection and first responder functions. (1) Uvex S3970DF Stealth OTG Safety GogglesThe Uvex S3970DF Stealth OTG Safety Goggles, coupled with earplugs and a N95 mask will (also included) will protect your orifices from debris and contaminants. 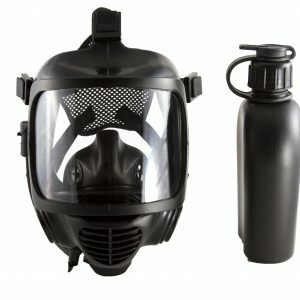 For more advanced protection, please check out our NBC System (hyperlink). (4) N95 MaskIn the years following 9/11, there are thousands of emergency workers suffering from horrible respiratory diseases and cancer from breathing in the dust left after the towers collapsed. If you are ever caught in a similar scenario, make sure you cover your face with an N95 mask or a damp cloth/bandana to prevent lung damage. Even if the event happened days or weeks prior, there may still be harmful contaminants in the air you want to avoid at all costs. 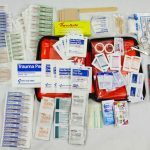 If it’s a true SHTF scenario, seeking medical assistance after the fact might not be an option. 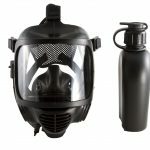 These masks are affordable and lightweight, but must be changed every few hours to maintain effectiveness in contaminated environments. For more comprehensive protection see our NBC System. (4) Sets of Ear PlugsThese soft low ear pressure plugs are comfortable for a variety of activities. Easy to roll foam easily inserts into ear and expands for a comfortable custom fit. Super comfortable foam allows hours of comfortable noise and sound protection. The plugs offer 31dB noise reduction. Here is a great video on how to use this compass to navigate a map. (1) Roll Duct Tape (50 feet)Duct tape has so many uses; it would probably take a whole book just to go through the possibilities. Here is a short list of the things you can do with Gods gift to man…Duct tape! (1) 50′ 550 ParacordParacord is another item that has a very long list of survival uses. (10) Large Zip TiesZip ties have similar uses to Paracord, but are better suited for certain things because of their rigid and seemingly unbreakable strength. Here are a few things you can use our zip ties for. (6) Heat PacksHeat Factory’s mini-size warmers are ideal for use inside gloves, mittens, pockets or any place where soothing heat is desired. 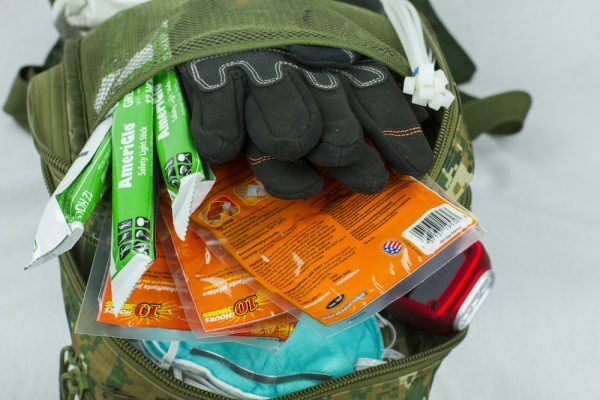 The lightweight pouches provide reliable, even heat for 10 hours. Hand warmers are safe to use, odorless and non-toxic. The Heat Factory warmer is a soft, lightweight pouch containing a biodegradable mixture of iron powder, charcoal, salt, sawdust and vermiculite. When exposed to the air, an oxidation process takes place that generates heat. Once activated, Heat Factory warmers can even be saved for later use (preferably within a week) if placed in an airtight container. Unopened, the Heat Factory warmer has a shelf life of three years or more. (2) 5′ Utility StrapsGreat way to fasten additional gear to your bug out bag to increase load capacity. I live and work in the city so this was the obvious choice. Kit was delivered next week with extra batteries like I requested. 5 stars! The pack and the contents were as described in the youtube video. I’m very pleased and happy with the kit. Found you on New York Times btw. Thx. Tablet box came smushed and zip ties we’re missing. Got both replaced for free but I had to pay for shipping. shipping and handling was a bit long but i am very happy with my survival kit. Presentation could have been better. For the price, you cannot make one like this on your own. I think you’re truly making a difference – best of luck. Couldn’t be happier with our purchase. We bought 4 different kits for our family. Fabian was able to customize each pack to ensure there weren’t duplicate items or items I already have at home. The whole process was as described to me and communication was constant and polite. I feel much more secured now than I did before I had any preps. Talk to these guys and you will too. Excellent customer service. It’s so hard to find online retailers who give a sh*t. These guys are cool and know their stuff. Thanks for all the recommendations. Yes, I will remember to change the batteries, lol. Saw this pack on TV and my friends and I laughed b/c I had the same one! I thought it necessary to comment and say how awesome it was seeing something I have on TV. Also, the kit freaking rocks! Pack is great. Service was amazing. Shipping took a little longer than I expected but the guys were accommodating and keep me in the loop the whole way. 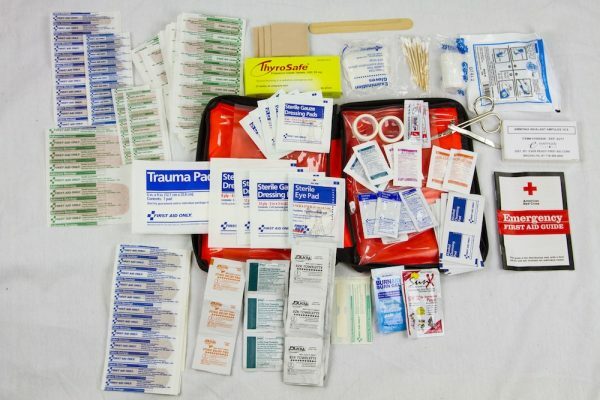 I would suggest this kit to everyone. This pack is so much better than all of the other kits online. If you’re not sure, just email Roman and he will hook you up! 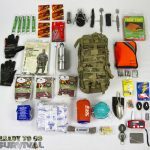 I live in the North West and my wife and I called the guys at Ready To Go Survival. They were friendly, sincere and honestly showed a passion and interest in our concerns. We spent two weeks talking before I made the purchase. I bought two packs and they were able to customize each pack for our needs. Best customer service Ive experienced in a long time. Saw this pack on blog and after much research, I decided this was by far the best pack on the market. Such a great birthday present. 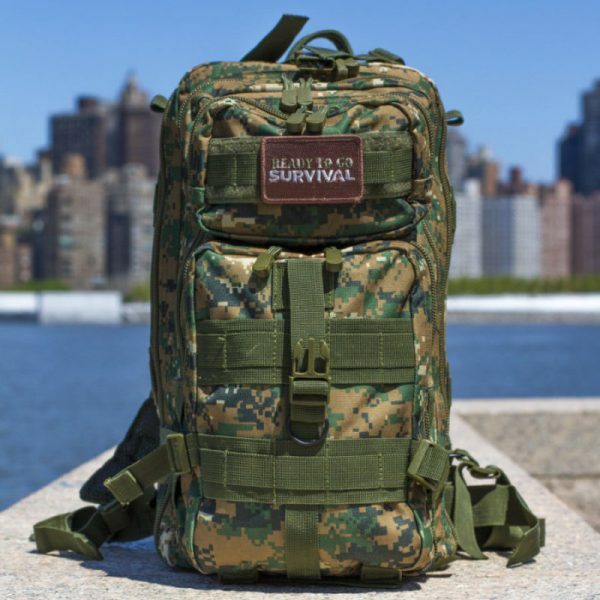 Thanks to the guys at Ready To Go Survival for customizing the pack for my son, he is so happy with his kit. My buddy bought this pack from you a few months ago and he said you guys were super nice and friendly (which is true). You walked me through the process and made sure everything was broken down. I felt very satisfied with the customer service and the overall quality of the items in the pack. I highly recommend. Woohoo! Let the zombies come, I’m ready! I’ve been waiting and waiting for the right moment to purchase a pack; saw your product on the web and based on reviews I knew this was the one. Very happy with purchase. Read about you guys online – great pack. Thanks for the help. My husband loves Doomsday preppers so I bought this pack for him as a Christmas present. He absolutely loves the kit. He wears it around the house and now is ready to bug out! Fantastic pack and even more fantastic customer service. Fast shipping and great follow up. I strongly recommend. Thanks guys. Saw this ad online and I compared each item and did thorough research on competitors and prices, this is by far the best value pre-assembled pack online. The guys were super nice and were able to customize the pack for me at no extra cost. Great pack. Bought it just in case if I have to run fast from Staten Island. Very compact and light! Incredibly impressed with not only the quality of the product, the packaging, the comprehensiveness and testing of what they offer, but with the customer service and dedication to the customer relationship. Truly outstanding even now several weeks after the sale. I highly recommend these guys and their products! High-quality products, expertly packaged – very happy with my purchase. I ordered this system earlier this year and because of the extreme exposure from the New York Times it took almost 4 weeks to receive the item. Other than that, the pack is great and neatly assembled. I’m very happy with my purchase. Fantastic pack. Got it quick and customer service before and after was really good.